Breakfast. I love it. What I don't love is my alarm clock. But there is something so hopeful about waking up to a new day and getting a do-over if maybe the day before didn't go so great. 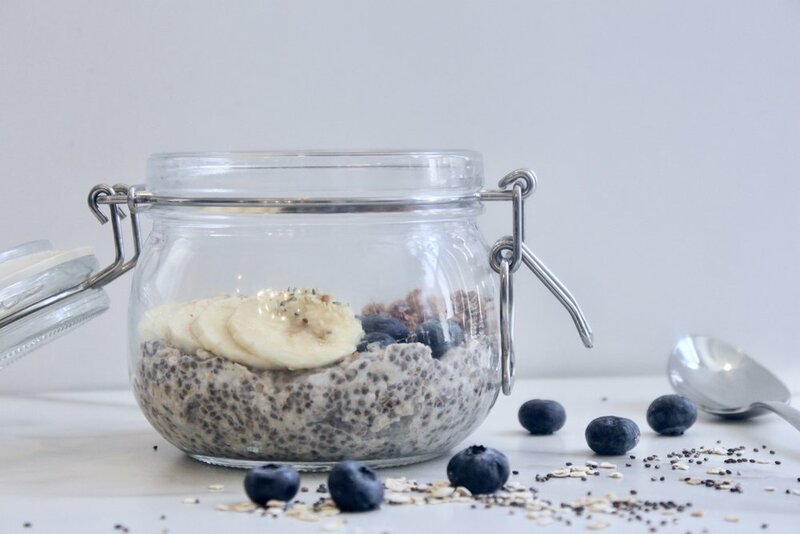 So tomorrow morning, press the do-over button and start your day with this goodness.....the oats & chia seeds have loads of fiber, not to mention the prebiotic effect of the oats (prebiotics are ingredients in food that our bodies don't completely digest, that when consumed, help support the growth of the good gut bacteria). This will help you stay full through lunch and power through your morning. Note: You can use any clean protein powder that you like but I love the effects of collagen peptides on my gut, hair, nails and skin. And it's tasteless so you can flavor your overnight oats as you wish! Also, you can meal prep the heck out of these. It's easiest to make all at once then divide up into containers after they soak. In a bowl, combine oats, chia seeds, milk, collagen protein, cinnamon, maple syrup, vanilla and salt. Mix thoroughly until combined. Cover and place in refrigerator overnight or for 4 hours minimum. Stir again in morning and top with favorite toppings. Enjoy your full belly and extended energy through lunch!